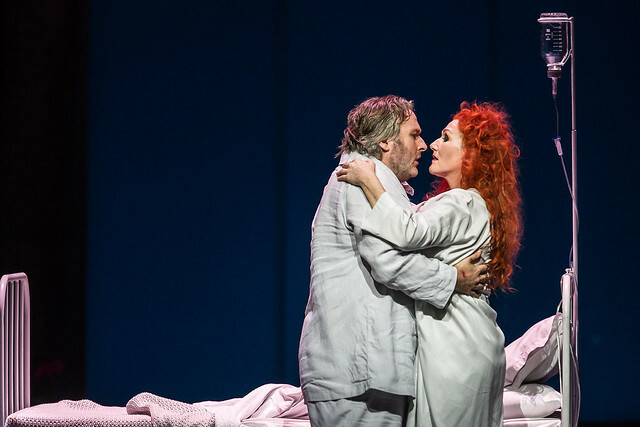 Stephen Langridge's Royal Opera production of Wagner’s final opera, starring Simon O'Neill, Angela Denoke, René Pape and Gerald Finley. Parsifal is now available to buy on DVD, both online and from the Royal Opera House Shop. This inventive new staging of Wagner’s final masterpiece is from the creative team behind The Minotaur, director Stephen Langridge and designer Alison Chitty. The production stars Simon O'Neill in the title role, with Angela Denoke as Kundry, René Pape as Gurnemanz and Gerald Finley as Amfortas. Music Director of The Royal Opera Antonio Pappano conducts. Parsifal tells the story of the Grail Community who are in anguish because their ruler Amfortas bears an incurable wound. Only a ‘poor fool, enlightened by compassion’ can save the ailing ruler. A mysterious youth arrives knowing little about himself, it is Parsifal - could he be the person to bring salvation to Amfortas? Wagner first read the poem that inspired Parsifal in 1845 but the opera was many years in the making, only receiving its premiere four decades later at the Bayreuth Festival in 1882. Langridge’s new production for The Royal Opera marked the bicentenary of Wagner’s birth. Parsifal is now available on DVD. Buy your copy now.